Super Mario: Erholung? Nein, danke! (English translation: Super Mario: Recreation? No, thanks!) is the name of a 4-page comic published in the 4/1993 issue of the German Club Nintendo magazine. Mario, Princess Toadstool, Luigi, and Yoshi are going on holiday in this comic. Obviously Mario booked the cheapest available holiday destination of the airline KoopAir, an island called Koopabiza, which makes Toadstool skeptical. When trying to check in at the airport, they find a seedy booking office and an obviously blind clerk. Another problem for the four friends is Donkey Kong Jr., an assistant at the baggage conveyor belt, who carelessly throws their baggage away. Finally, after walking all the way from the airport building - there is no courtesy bus available - Mario and his fellows reach their plane. Toadstool, again, is not satisfied with the condition of the airplane, calling it a "rattletrap". Even Mario is a bit skeptical as he enters, urged by Wendy O. Koopa, the stewardess. Inside the plane, Mario looks out of the window and notices that the blind clerk is their pilot. After the take-off, Wendy O. Koopa delivers the meal - pizza in boxes. Mario and his friends in their "president's suite". Surprisingly, Mario, Toadstool, Luigi, and Yoshi reach their destination unscathed. However, the next bad surprise for them is their coach, which is in a very bad condition. Their hotel, the Gumba Royal Hotel, surprisingly looks good. When opening the door, however, the pane immediately breaks. At the desk, the friends are told that there are no single rooms available anymore, only the "president's suite". The page - without carrying their baggage - takes them to their room. 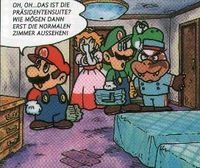 Again, the "president's suite" is in a very bad condition, making Mario wonder how normal rooms in this hotel would look like. When Toadstool runs out of the bathroom screaming, Yoshi suggests to go swimming. This, however, turns out as very difficult, since the four friends cannot find water anywhere. Finally, they find that they're already in the water, which barely covers their feet. At night, there is another problem for them. Ear-shattering noise arouses them from sleep, coming from the hotel disco beneath. The din even results in the rupturing of the floor, which causes Mario, Luigi, Toadstool, and Yoshi to fall down, directly onto the dance floor. Hurried and, in Mario's case, even without changing clothes, the four friends flee out of the hotel which soon after falls in. At the end of the comic, Mario and his fellows can be seen relaxing on their balcony and enjoying their holiday at home. Besides the above-named characters, there are other KoopAir employees appearing in this comic. Ludwig von Koopa serves as a mechanic working on Mario's and his friends' plane. Wario is their tourist guide, waiting for them at their coach. In the hotel, Bowser works at the desk and Morton Koopa Jr. serves as their hotel page. Among the people trying to get to the water at the hotel are several Koopa Troopas and Goombas. Characters in the hotel disco include Bowser, Lemmy Koopa and, oddly, even Wendy O. Koopa, who is dressed differently from the stewardess. This page was last edited on September 24, 2017, at 19:54.